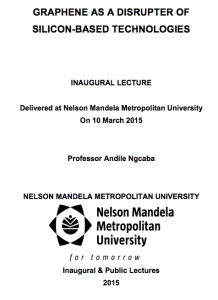 On the 10th March 2015, professor Andile Ngcaba delivered his inaugural lecture at the Nelson Mandela Metropolitan University. Below is a copy of his paper that details graphene as a disrupter of silicon-based technologies. This paper discusses how the evolution of scientific knowledge has built upon previous discoveries, and how science has brought us to the point where we are able to manufacture tools on the nanoscale for use in circuits that have applications for every aspect of human activity. Today’s computer-component market is dominated by complementary metal oxide semiconductor (CMOS) technology. Four decades of research have gone into optimising the power consumption and performance of this technology. But CMOS is rapidly approaching its limits in terms of scalability. 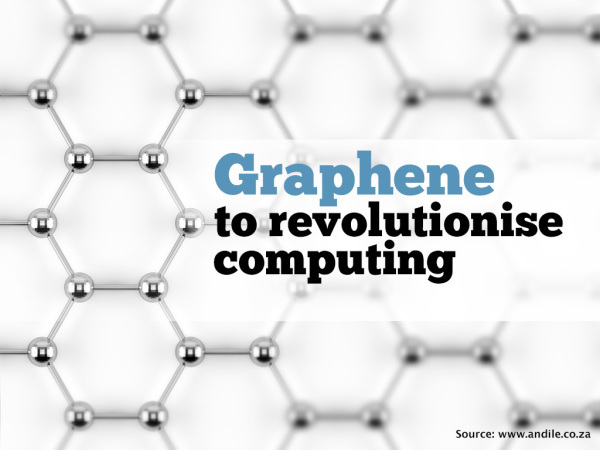 Nanomaterials – especially graphene, which has beneficial electric and physical properties – offer a solution that could catapult science into a new era liberated from the constraints of current technologies. The history of science is punctuated by pioneering efforts in various disciplines. The names of savants and theorists such as Ernst Mach, Albert Einstein and David Bohm are as recognisable in tableside scientific discussion as the discovery of fire. But their contributions are not limited to the field of scientific inquiry. Owing to their achievements, these individuals have become well known in the academic and commercial fields. Accordingly, this paper begins by providing a brief history of scientific discipline, beginning with prehistory and leading up to the theories and principles that govern modern science. The paper will then continue to look into the futuristic field of quantum and nano-computing, asking what can be achieved using these emerging tools.